The Kii Three is clean, detailed and even in the bass to an extent that is rare at almost any price, so it shows you both the nature of the original signal and the partnering electronics with considerable clarity. With some recordings this can slide into a degree of exposure that is less appealing than you might hope. Van Morrison’s voice on Astral Weeks [Warner], for instance, sounds as if it’s a little too much for the microphones: there is an audible strain. At the same time, what he is singing and what the band is playing has never been clearer. If you want to decipher lyrics I’m certain there is not a better speaker for the purpose; this was made clear playing Radiohead’s A Moon Shaped Pool [XL] where Thom Yorke’s mutterings were made intelligible for the first time in my experience. I’m not saying they made much sense, but the words themselves were clear. Separation of instruments and voices is likewise transparently obvious, so that you can hear the characteristics of each with utmost ease. One visitor put on a Bob Dylan track he has been playing for decades [‘Absolutely Sweet Marie’ from Blonde on Blonde, Columbia] and was stunned by how much he could hear in the mix, the way the drums sounded being particularly novel. Material with plenty of bass was even more explicitly exposed; this is where the room has the greatest impact on the overall sound and by minimising this aspect the Kii Three opens up the lower registers and makes them as transparent as the mid and top. There is a problem with this, however. Speakers that interact with the room are the norm, it’s what we’ve been listening to all our lives; the sound of our favourite music is a combination of speaker and room. Rooms and speakers may have changed but the summing effect has always been there. Take that away and you have a different sound, one that seems less familiar. Is it less enjoyable is really the question of course. And the answer is an emphatic ‘no’. The original performance is the same, but it’s just that you can hear more of it, and with a bit of familiarisation it becomes even more engaging and transporting. The emotional quotient takes a bit of recalibration to appreciate but it’s still very much there for the taking and I found myself becoming quite misty eyed with some old favourites. I also found that for once the Innuos Zenith SE server was not the best source for the job, which became apparent when I switched to a Melco N1ZS/2A. This server has a slightly warmer, smoother character that suits the explicit balance of the Kii Three very well indeed. Both servers were streaming through an AURALiC ARIES G2 before the signal went to the Kii Controller (which sounds a lot better than taking a direct USB output from either server), but the subtle change in balance made the Melco the better partner, the one that with good recordings transcends the usual limitations of reproduced audio to create a palpably real musical experience. The recording that did this most effectively was Fiona Boyes’ Professin’ the Blues[Reference Recording], which always sounds good but here became so vivid that it was exhilarating. Less ‘audiophile’ recordings also sounded extraordinary; Arab Strap’s ‘New Birds’ [Philophobia, Chemikal Underground]revealed its unusually wide dynamic range and more of both the Glaswegian accent of the singer and the beautiful texture of the bass guitar. 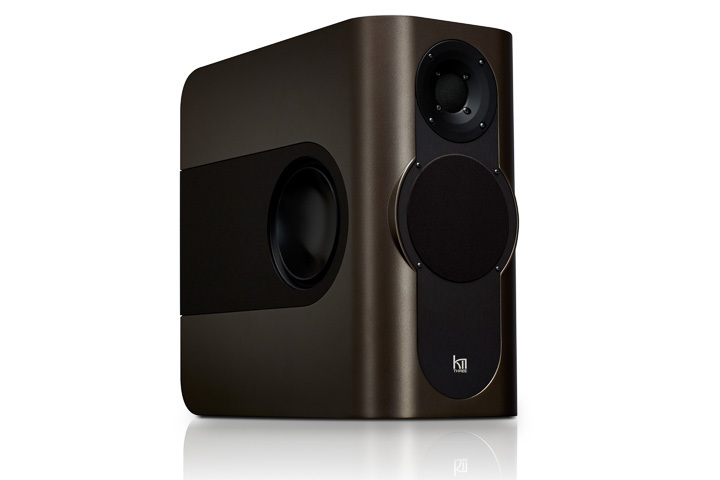 It all comes back to the bass; other speakers sound warmer and fuller because the bass is being reinforced by the room. Here, the bass seems leaner because it’s not doing this but at the same time it extends very low and remains perfectly in time. The Kii Three doesn’t sound like a typically fast or timely speaker but it stops and starts faster than virtually any other. The combination of high power active operation with minimal low frequency veiling means that every nuance of the bass is that much easier to hear, and the denser the piece of music the more apparent this becomes. The dynamics on Beethoven’s 5th are bang on and the bass on Steely Dan’s ‘Show Biz Kids’ [Countdown to Ecstasy, ABC] is surprisingly deep and extended, suggesting that some tweaking must have been done for the digital release. But ultimately you are struck by how well put together this and other pieces of music are; the insight that this speaker provides makes this more apparent than ever.